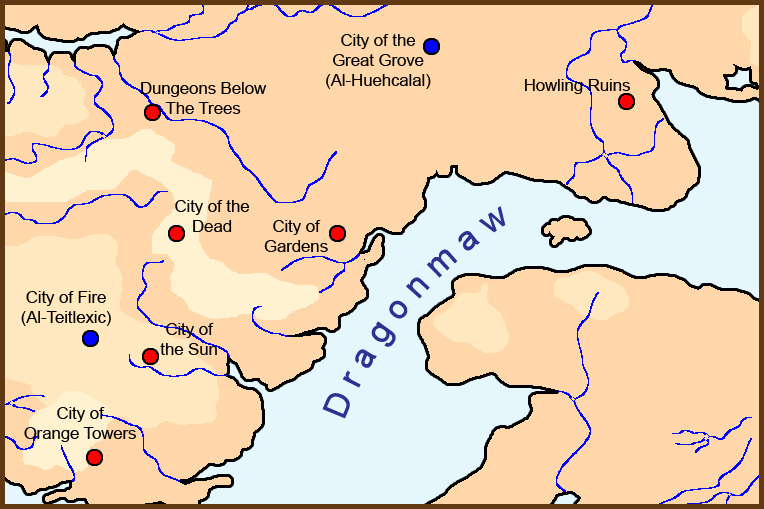 The Shi'imti civilization (Draconic: Scaementia) state in western and central Nora. The shi'imti used a strange script of angular characters. This script evolved over time. Shi'im is shrouded in mystery. Their exact culture, their magic, everything has been lost with time. The most perplexing mystery is how the aardians separated into the gnolls and kamiks. Many of their ruined ziggurats still dot the Fainish landscape, but as they are usually home to gnoll tribes, it is very difficult to gain access. Most of what is known about the Shi'imti is derived from the findings of Broderic Qotten, who explored the Eight Great Cities of Shi'im, including the two Late Shi'imti capital cities, Al-Huehcalal and Al-Teitlexic. Within the Dungeons Below the Trees was found the Red Tablet, which gives insight to the world of the Early Shi'imti period. The great monuments contain barely legible carvings. Myths from the Aier Men also give insight to some Shi'imti aspects. Although the exact reasons for the collapse of the civilization are unknown, most theories deal with a legendary cataclysm which destroyed an entire city. Knowledge of the empire has been lost for thousands of years, but rediscovery of the civilization has restarted. 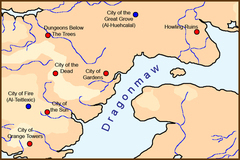 Dr. Broderic Qotten of the Compass Society had explored many Shi'imti sites at his own risk due to ancient traps and the infestation of gnolls. Eight major ruins have been identified at central to the civilization, though much of these sites remain unexplored. 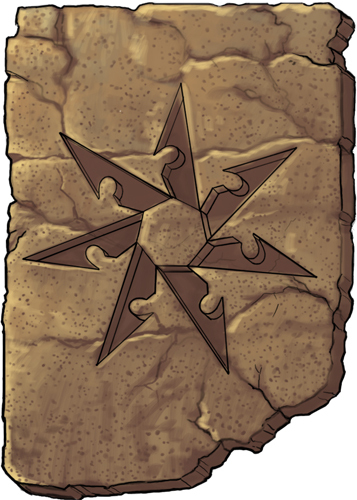 Dating to the early Shi'imti empire, this tablet details the reign of King Chiltilmahtliltic (Red Blackcloak) and his efforts in freeing his people from the yoke of foreign oppression. During the Early Period, Shi'im was invaded by the Tilmahtliltical people. The Shi'imti kings during this time wore black cloaks to symbolize their submission to the foreigners. The City of the Dead was a very important place in the mountains. During this time, the sacred symbol of the circle appears with regularity. During the Late Period, Shi'im was entirely sovereign. However, there were two separate cities found which declare themselves as capitals. Early scholars believed the capital moved from one city to another with the change of kings, but Dr. Qotten has determined writings and depictions of the same event in which both cities were used as capitals. Therefore, Late Shi'im was not ruled by a single ruler, but by two Wizard-Kings. The two kings shared responsibilities and helped govern a large territory. They were quite proficient in the Shi'imti style of magic. The two most prosperous kings were Cochiz of Al-Huehcalal and Mayana of Al-Teitlexic. The sacred symbol of the circle has been replaced in this period by the seven pointed Sihedron rune, which became one of the most important runes of Later Shi'im. The Sihedron Rune signifies not only the seven virtues of rule (generally agreed among scholars to have been Chastity, Temperance, Charity, Diligence, Patience, Kindness, and Humility), but also the seven schools of magic recognized by Shi'im (divination magic, Qotten points out, was not likely held in high regard by the ancients). The Sihedron Rune was certainly a symbol of power, one that may well have stood for and symbolized the civilization itself. Aquarian writers wrote about a grand cataclysm that ended the land of Scaementia. Due to the descriptions of this land and the relative time of its destruction, Dr. Qotten has surmised that this is referring to Shi'im. Aboleth invasion: Some theorize that Shi'im stole its magic from the aboleths living in Lake Granlea. The aboleths then invaded Shi'im and destroyed them in retaliation. Aberration corruption: The summoning of aberrations lead to the insanity of its wizards and rulers and lead to collapse. Giant Revolt: The giants that were used as slaves rose up and slew their masters before retreating into the mountains. During the Late Period, magic appears in the record. Many wall paintings refer to verbal components, with the trigger word, represented by a single character, flowing from the caster. The large monuments and buildings constructed by the Shi'im are still found today. The unnatural way many of these monuments have resisted erosion and the march of time testifies to their skill at magic, though no magic has ever been detected from these structures. During the Late Period, many statues of kings were found, but their faces were blank, only displaying the holy symbol of their reign. Shi'im shows the first instance of the use of cement, which itself is named after the civilization. This helped the Shi'imti to build on such massive scales. There have been two different writing structures found, easily distinguishable as Early Period Script and Late Period Script. Early period script had an emphasis on round, fluid characters and dots, while the Late period script was more sharp, featuring angular lines. Wall paintings, reliefs, carvings, masks, pottery, circuitry, jade, obsidian, turquoise. The Aier Men of Ilefain remembered Shi'im in their histories and legends as a terrible and evil civilization. Barbarian tales, passed on by storytellers for thousands of years, remember the Wizard Kings as the Tarvos, a larger-than-life pantheon of war-bringers and punishers of the dishonorable. They remembered the rulers of Shi'im as demons and spoke of them only in hushed tones. Massive monuments have been found all over central Ilefain. Such great scale was not seen again until the very end of the Aquarian Empire. Dr. Qotten believes these stone rings to have been used as transportation devices, allowing the regular and stable opening of intra-planar portals. There have been mention of Shi'imti libraries, but none have yet been discovered.